Difficulty: Easy. All finished sections of the rail trail are mostly flat and consist of stone dust. To start from the Ware River/White Valley parking lot in Barre; From the junction of Routes 122A &122 in Rutland, take Route 122 north. You will pass by multiple trail parking lots along this road. After crossing over the Ware River travel less then a mile and you'll see the trail alongside your left. Take your next left into the White Valley wayside park next to the river where the trail currently begins. To start from the Wachusett Street parking lot; From the junction of Routes 122A & 68 in Holden, take Route 68 north. Turn left on Wachusett St and the parking lot will be on the left side of the road. The Mass Central Rail Trail is a planned 104 mile trail from Northampton Massachusetts to Boston. It will follow the old Central Mass Branch of the Boston & Maine RR that ran between the two cities. The railroad was abandoned in 1938 after the 38 hurricane shattered the line. The trail today exists in many unconnected sections and with differing surfaces. Starting from Northampton heading east the sections that are complete include the Mass Central Rail Trail; Norwottuck East, Mass Central Rail Trail: Belchertown , Mass Central Rail Trail; New Braintree-Hardwick , Mass Central Rail Trail; Barre-Rutland , Mass Central Rail Trail; Holden-West Boylston & Mass Central Rail Trail; Sterling in the towns of Belchertown, Braintree, Hardwick, Barre, Oakham, Rutland, Holden, West Boylston and Sterling. Outside of Boston, the towns of Wayland & Weston are currently converting their sections of rail bed in 2018. In Cambridge the last section of the Mass Central Rail Trail has been completed and is referred to as the Fitchburg Cutoff . It connects to another Spoke of trails that all radiate out from Alewife T Station: See; Minuteman Bikeway , Alewife Brook Greenway , Fresh Pond Loop Trail and the Somerville Community Path . 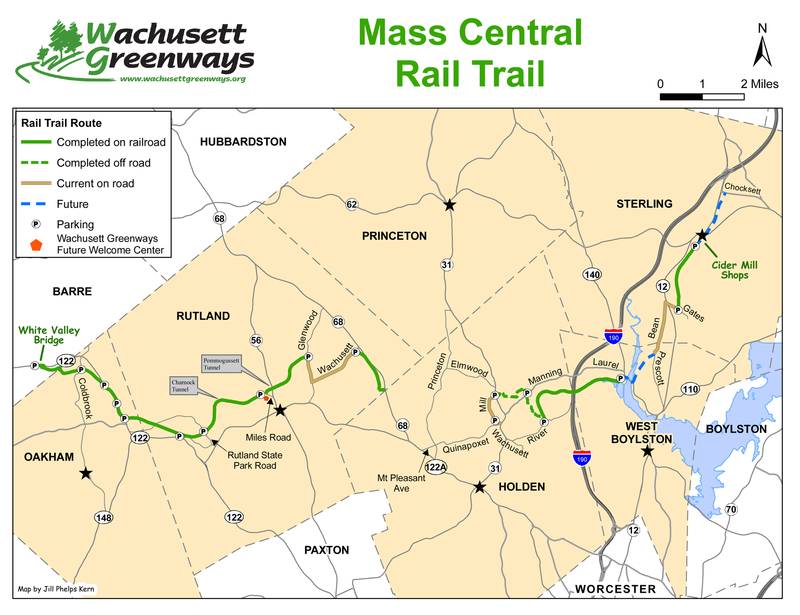 For more information check out; MASS CENTRAL RAIL TRAIL , WACHUSETT GREENWAY or EAST COAST GREENWAY .You may also access the Ware River Rail Trail in Oakham/Coldbrook Springs. This is an undeveloped, but cleared rail trail of hard packed dirt & gravel accessed off of Route 122 via Old Worchester Rd. From the Ware River parking area; The stone-dust trail travels east from the "White Valley" parking lot (site of a former cotton mill) alongside the river. Cross over the Ware River via an iron bridge. Note the stream gauge station below next to a cement sluiceway. A switchback brings you up to the rail trail which then travels east just above the river. This section utilizes the old Boston & Albany rail bed while the old Mass Central rail bed parallels this trail above right. If you look up along your right you can spot some old stone culverts under that rail bed. After 0.6 miles you'll have a great view of a curved stone dam in the river and huge stone building (part of the Ware River watershed). A switchback takes you off this old rail bed, away from the river and up to the old Mass Central rail bed at a mile. As you travel through this heavily forested section look left to spot an old RR mileage marker. This one is a bit faded but reads B60/N44 (Boston 60 miles/Northampton 44 miles). These granite markers were located every mile along the RR line. Cross Coldbrook Road to the parking lot where the stone-dust trail picks up at 1.5 miles. An informational sign is located just past the gate and describes the old Coldbrook Springs RR Depot that was located here. The first train passed through here in 1887. I believe the old stone foundation was a part of it. Continue southeast into the woods along a ridgeline. Travel underneath some transmission lines before coming to a path on your left leading down to another parking lot alongside Route 122 at 2.1 miles. Just past this path look left to spot another old RR Mileage marker (B59/N45) that has been painted. Parkers Brook is now below to your left, which you then cross over via another iron & wood bridge. USE CAUTION crossing busy Route 122. Continue alongside the brook, over more bridges and past many marshes. At 2.7 miles you'll pass by a spur trail up another parking lot off Route 122. Continue past the marsh, then over a causeway between Muddy Pond. A slight incline brings you up to Whitehall Rd (dirt) then down through a cut. You'll come to an intersection and granite bench after 4.5 miles. The Midstate Trail crosses here. Note; Right will bring you to the Midstate Trail parking lot. Continue straight along an older section of the trail which is not as wide. You'll cross a small berm that has a split rail fence on your left. Down below to the left RUTLAND STATE PARK . Continuing along the trail, you cross over a very high berm that passes between a body of water that I believe is part of the Barre Falls Reservation. The trail then comes to State Park Rd at 5.2 miles where you'll find a map board. A parking lot is located to your left. Cross the road to where the trail heads up a small hill and then levels back out. The trail then passes through a tunnel underneath Charnock Hill Rd at 6.1 miles and emerges in a moss covered, deep, rock cut. Very scenic, especially in the spring. A stream follows the trail a bit until you come to Thayer Pond. Nice granite benches overlooking the pond. Several beaver lodges. A causeway takes you over the pond and past an old RR bridge abutment. Another granite post marks the trails entrance as you come to the Miles Road parking lot at 7.2 miles. Another map board located here. Note; They are currently constructing a trail alongside Miles Rd that will bring you to the new Welcome Center (21 Miles Rd) which is also under construction; Expected completion in 2014. Head right on-road up Miles Rd for 0.1 miles and you'll pick up the trail again on the left. You'll pass by the foundation of the old Rutland Water Tower & RR Depot. Another tunnel takes you underneath Route 56 and alongside Moulton Pond. At 8 miles you come to a granite slab marking the spot of a head-on train wreak in 1932. Soon after you cross another culvert for a stream running into Moulton Pond. A beaver dam lies below. The trail is very wide and open as you come to Glenwood Road at 8.8 miles. A signboard is located here, as well as a parking area across the road. The next 1.2 mile section to Wachusett St is undeveloped and blocked at the opposite end by private ownership. Last updated May 2013. From the Wachusett Street parking lot; The finished section of the trail heads southeast towards Holden. There is a signboard and map located here. Head past the gate along the wide, flat trail, which consists of stone-dust. You'll pass by a nice granite bench as you head into the woods along a hillside. After only 0.3 miles, look left to spot an old railroad mileage marker with B51 on one side (51 miles to Boston) and N53 on the other (53 miles to Northampton). Soon you'll spot Route 68 below to your left. Keep an eye to your right and you may spot some tubing running from tree to tree gathering Maple sap. After you pass through a small rock cut you'll come to an intersection at 1.1 miles. Straight, the rail trail continues undeveloped. The stone dust trail turns left and heads downhill to Route 68 where it ends at 1 ¼ miles. This is a steep hill, which you'll then have to climb back up. However, across Route 68 is Shaft #4 of the Quabbin Aqueduct. This stone building with the slate roof and copper gutters was built in 1931and serves the Quabbin Reservoir. The reservoir was built between 1926 and 1939 and flooded 39 square miles of land. Four towns were abandoned from the area to accommodate the reservoir. A 60 mile pipeline and aqueduct delivers water to the Boston area from the reservoir and this shaft is part of it. See; Quabbin Reservoir . Currently, you must go on-road from here to reach more eastern sections of the Mass Central Rail Trail. See; Mass Central Rail Trail; Holden-West Boylston .